There are some experiences that, while very small to adults, make a huge impact to a child. I had the opportunity not only to attend and observe, but to participate in just such an event this week for one of my son’s friends. For most Cub Scouts, there is a very important intermediate step between the transition of elementary age Cubs and Middle School aged Boy Scouts. This stage is called Webelos, or “We’ll Be Loyal Scouts”. For a select few, this rank culminates in an award known as the Arrow of Light, the highest award a Cub Scout can earn. One young man, Eric, who joined our pack over the summer, came to us from a pack in Florida. Being the son of an Army recruiter, he has moved around quite a bit. Over the last five years, he has been a member of three different Cub Scout Packs. Despite this, he was not only the first Webelos of Pack 374 this year to earn his Arrow of Light, but he also earned the Webelos Super Achiever Award, an award for a Webelos who has earned every possible Activity Badge. This award is so rarely handed out, that when the Cubmaster went to pick it up at the Scout Store, at first no one knew what he was asking for. After they figured it out, several council employees came out of the office to ask the name of the scout who earned such an award. Eric’s dad Tim presented the Pack with a new ceremonial Arrow of Light Candle Holder, and as the Cubmaster read through the ceremony, Eric and his parents took turns lighting the seven candles, which stood for the seven points of light on the Arrow of Light insignia. 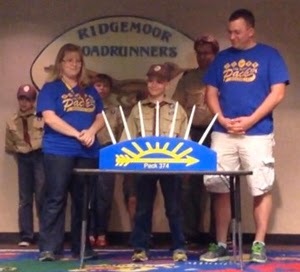 Then the Pack members and his parents presented him with a homemade arrow carved by a local scoutmaster, and a plaque to hang it on. Eric’s mom even carefully assembled a shadow box of each award Eric had earned along his journey. Of course no Cub Scout meeting would be complete without a degree of goofy fun, too. After the ceremony, the boys got to use PVC pipe to create a lung-powered marshmallow rifle. With this “firearm”, the boys got a brief entry level course in range safety and how to listed to a “range master” for direction. Undoubtedly, this was a night that many of the boys, definitely Eric and his family, will never forget. 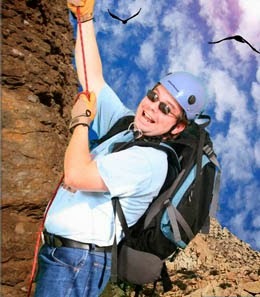 David Baker, our Man About Menifee, writes about his adventures in and around town. You may leave comments for him here or email him at manaboutmenifee@gmail.com.